Details now available for the Anoka-Hennepin Fall Choral Gala on Monday, October 10, at Benson Great Hall, Bethel University. The Fall Choral Gala at Benson Great Hall will feature the Treble Choir and Concert Choir only. Other students are welcome to attend the concert on their own, but will not be singing and may not ride the bus with the performing ensembles. All students must complete this downloadable permission form, have it signed by a parent or guardian, and return it to Ms. Tempel no later than Friday, October 7, 2011. Tickets are $5 each, available in advance from Ms. Tempel or on the day of the concert at the Benson Great Hall Box Office. Students may bring cash or check payable to CPHS Vocal Music to purchase tickets during the school day through Friday, October 7. Tickets will not be available for purchase during school on Monday, October 10. 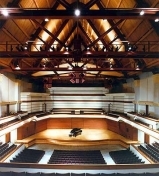 Benson Great Hall is located on the campus of Bethel University at 3900 Bethel Drive in Arden Hills. Parking near the hall is free. Click here for directions. Students will ride a bus with their ensemble to the concert. All students must ride home with a parent/guardian following the concert. Students are encouraged to eat supper before loading the bus at 4:00 pm. However, the Bethel University cafeteria will accommodate students needing to eat on campus for $8.00. Students must bring cash to pay at the cafeteria. Note: Time will be very limited for on-campus dining.